The second summer in Albania has reached its dog days and, to tell the truth, I don’t quite know where it went. It seemed like last summer lasted forever in comparison to these speedy last few months. Perhaps that had to do with the fact that Albania was a brand new place – a playground to explore on the weekends – and now it’s more familiar. My current tolerance for traveling long hours in hot furgons is a bit more limited than last summer’s after having (somewhat) satisfied my desire to see the country. Also – being busier than ever in Lezhe might have something to do with the swiftly passing time. But, in between projects I’ve still managed to fit in a little exploring. 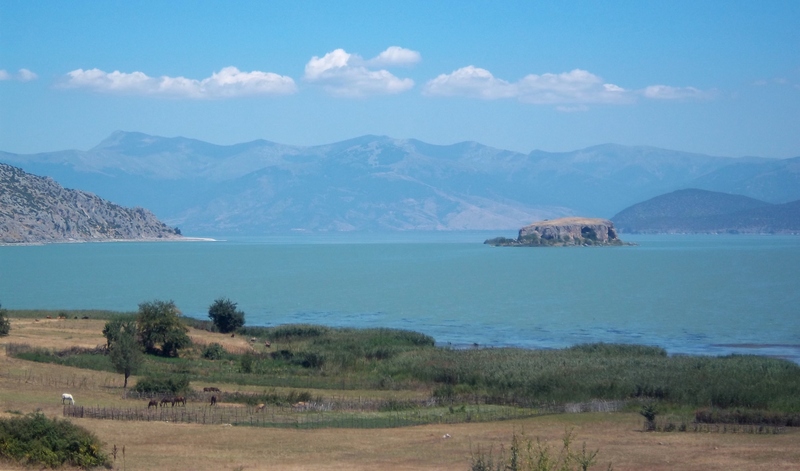 A week or so ago, following the obligatory PCV reunion at the Korçe Beer Fest, Adam and I headed to nearby Lake Prespa. Prespa is a relatively forgotten corner of Albania – close to Korçe, but not nearly as popular or built up as its neighbor lake Ohrid. In fact, there’s none of the commercialism and beachey-ness of Pogradec. We stayed in Zaroshka, a small village with two tiny hotel/restaurants plopped down in between the haystacks and donkeys on the edge of the lake in the corner just where Albania meets Macedonia and Greece. Looking out from where we stayed over the lake on the neighboring states and listening to the locals speak a mix of Macedonian and Albanian made it feel like we were in a different world from the previous night’s hubub in Korçe. Zaroshka has a striking and different structure from many other Albanian villages, including Bishqem. It’s completely centralized for a small village. The houses are tightly packed in the center and the farm plots and barns form a ring around the outside. It even seemed like parts of the Communist-era cooperative ideal still remained in that we noticed all the animals of the village being herded together out to pasture. I also wonder how the social structure of such a village differs from a place like Bishqem that is the definition of decentralized. For example. there are parts of Bishqem not far from my host family’s house that my 18 year-old host sister has never been to because she never had any reason to go there. I don’t think there are any strangers in Zaroshkë. In two days on the lake I was able to relax in a way it’s hard to normally do in my life in Albania. We didn’t make it out to the island (see above) that harbors a medieval church inside of a cave, but we did walk the rock beach towards the Greek border, eat wonderful food, watch fishermen in the morning and evenings and Korçans out for a day trip or wedding. And, we were able to get a sense for another of the subtle yet complex ways geography plays a part in cultural interactions in the Balkans. Just beautiful! It is hard to see summer go by – always too fast! Football starts in 2 weeks! I saw Wilson when she got back from her adventure – she looks great! You all are such world travelers! Love your adventures! Happy Fall!